There is a common view among Creationist climatologists and physicists that there was one Ice Age post Noah Flood in contrast to the many Ice ages proposed in secular literature A brief overview is as follows: During the late period of the Flood there was much breaking apart of the one land mass into continents, involving subduction of the earth's surface and subsequent newly formed seafloors which heated the water. As well, there was great volcanic activity at these areas of subduction. The developing oceans were "hot" and water evaporated off from them, but due to increased cloud cover from the volcanic ash the water re-precipitated over the cooler land surfaces as snow-massive amounts of it. This great snowfall consolidated and became ice sheets. Some have felt that the Ice Age lasted about 500 years-with the earth's land surface gradually to warming up. "Subduction zone volcanoes continued to erupt for centuries after the Flood, gradually decreasing in number and intensity. They ejected aerosols (tiny particles and droplets) into the atmosphere that reflected significant amounts of sunlight, resulting in cooler summers that prevented winter snow and ice from melting. As the snow and ice accumulated year after year, thick ice sheets formed." Dr Michael Oard a climatologist was one who proposed this scenario. (It is updated by Dr Jake Hebert, a physicist in ICR Acts and Facts vol. 47 #11 Nov. 2018.) An online version of this concept contrasting it with the secular multi-ice ages view is online by CMI-see link below. Will There Be Another Ice Age ? An Article by Dr John Morris-a geologist titled "The Ice Age Causes and Consequences"
"The key to the Ice Age was temperature--not cold, but warm. Ice comes from snow, and snow from moisture in the air, which in turn comes through evaporation, which comes from warm water. The Flood oceans were quite warm due to the introduction of huge volumes of superheated water from the "fountains of the great deep" (Genesis 7:11) and frictional heating by shifting continents, etc." See link below. "Researchers Michael Oard, Steve Austin, and others have argued that heat released from catastrophic processes of the Genesis Flood would have heated the oceans. Drilling of ocean sediments led researchers to conclude that the oceans were at least 36°F hotter in the past. Also, oceanographic cartographers Bruce Heezen and Marie Tharp published images of the ocean floor obtained in the 1960s that show mid-ocean ridges and undersea volcanoes that likely released large quantities of heat during past earth upheavals. Higher sea-surface temperatures would have evaporated large quantities of water vapor from the oceans, energized mid-latitude storms and hurricanes, and precipitated large quantities of rain and snow on the continents." See link below. Dr Larry Vardiman also discussed the formation and impact of an Ice Age on Yosemite NP. "Yosemite National Park contains evidence that glaciers once filled Yosemite Valley to a depth of over 3,000 feet, almost to the top of Half Dome, and covered most of the higher elevations in the park...The enhanced snowfall and greater frequency of storms during the Ice Age appear to be adequate to explain glaciation in the Sierra Nevada in a young-earth time frame. Glaciers thousands of feet thick could have readily developed in hundreds of years following the Genesis Flood." He also discussed the "Pineapple Express Storm" conditions that have been shown in modern times to drop enormous amounts of snow. 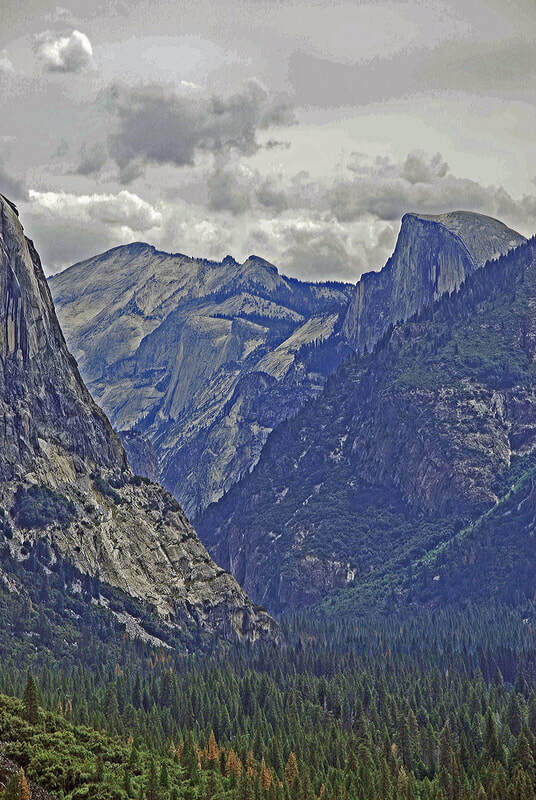 Photo of entrance to Yosemite by JGL. The granite escarpments are plain to see and the work of rapid abrasion on the rock by glacier meltdown post Flood. An article Earth's Thick Ice Sheets Are Young by Dr Jake Hebert at ICR has come out in their Impact Magazine for February 2019. He reviews and discusses the results of deep ice core findings from Dome Fuji, Vostok and the EPICA Dome in Antarctica. His summary is: 1) "secular scientists believe polar ice cores prove 'millions of years'", 2) "Volcanic ash layers known as tephra strongly suggest that secular ages for the bottom halves of long Antarctic cores are greatly inflated", and 3) "The rock surface beneath the Antarctic ice sheet isn't eroded enough to have been ground by moving ice for millions of years." No online article is out yet (as of 1-23-19). ​JGL Note: the probable ice sheets have been largely melted and removed from Yosemite, but not from the Antarctic.